The Louisiana Division owns a large collection of bookplates, most of them acquired during the 1940s and 1950s. The bulk of the collection stems from a donation in 1957 of the bookplates collected by two sisters, Jane Grey Rogers and Elizabeth Palfrey. Other plates came into the collection from patrons who provided samples of their personal bookplates in response to solicitations for exhibits in 1940 and in 1955. 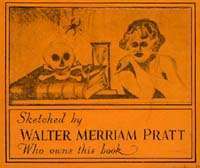 One of our early Images of the Month Gallery also focused on bookplates. 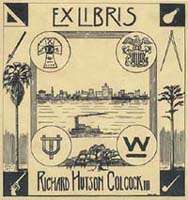 In January 1998, in honor of the American Library Association Midwinter meeting in New Orleans, we featured bookplates used by local, national, and international libraries (there was even one from a shipboard library!). This month, we thought we'd show you a few more. 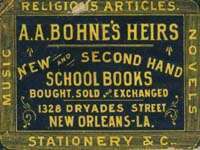 Because of their historical, artistic, and literary interest, and perhaps because of the hints they hold to the personalities of the people who owned them, bookplates have long been popular as collectibles, and many of them have made their way into libraries around the world. Yale University's Mudd Library, for example, has over a million bookplates in its collection, and the British Museum also owns a huge number of plates. The Bookplate Collection in NOPL's Louisiana Division numbers in the thousands and is arranged in categories: bookplates of NOPL, bookplates of other Louisiana libraries, heraldic plates (both British and American), medical plates (both personal and institutional), personal plates (from the U.S. and from other countries), bookplates of non-Louisiana libraries and societies, and local plates (both personal and institutional).